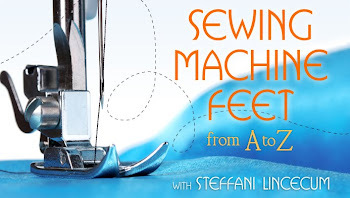 This is the most common question I get in my sewing classes when we're working from a sewing pattern. You take your measurements according to the package directions and then you find those measurements on the chart on the envelope. But your bust is in one size column, your waist is in another size column and your hips could even be in a third column. You don't know which size to buy let alone cut out and sew. Where to start? Well, this is the shortest, easiest way to get the best result. I'll show you how you can use all those sizes and make a garment that is the closest thing you'll have to fitting your personal shape. First let me say, there's a lot that goes into making these patterns and the companies do their best to come up with the most common averages of waist to hip to bust ratios, but very few people are the exact statistical average proportions. There are as many different variables on shapes and proportions as there are people. 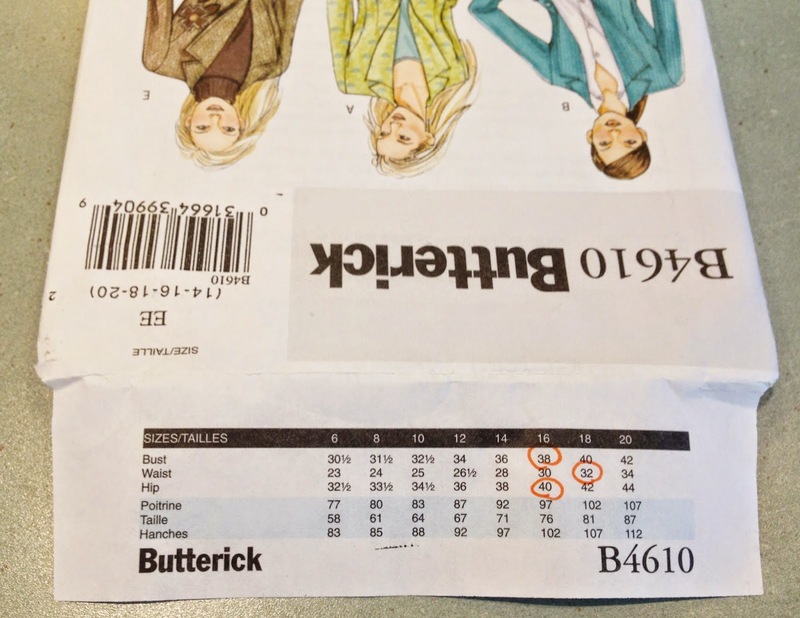 The sewing patterns you buy are just a very good solid jumping off point, it's up to you to know that there's nothing wrong with you for being different sizes, these are just useful pieces of paper that are meant to help, not make you pull out your hair. They're meant to be tools that when mastered, let you be more creative. So, let's just assume that pretty much everyone will need to know how to cut for several sizes within one garment and go from there. Next we need to decide which size to actually buy. My advice is to buy the size that will fit your bust and shoulder area, because these are the areas with the most variables in fitting and if you can begin with a size in this area that's as close to you as possible, the waist and hips and lengths are much easier to adjust. You've taken your measurements and they show that you would need a 16 in the bust, an 18 in the waist and a 16 in the hips. I circle my measurements as shown above to make sure I don't have to look back at the measurement sheet again for this project for these measurements. So based on my logic of buying the size that most closely matches the bust I'd buy the envelope with the size 16 in it and adjust the waist and hips. 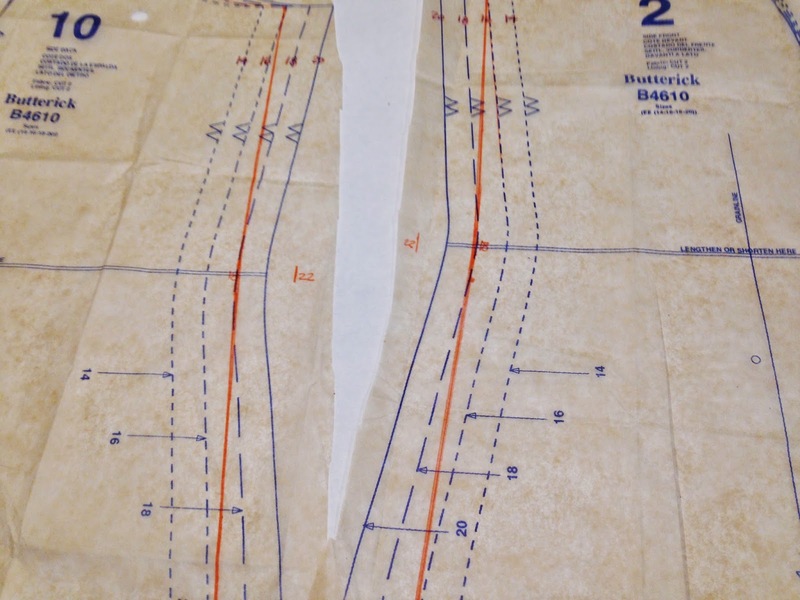 Once you have your pieces free from the group, then you'll go through each piece and mark the lines that you'll cut for that particular area based on your measurements. 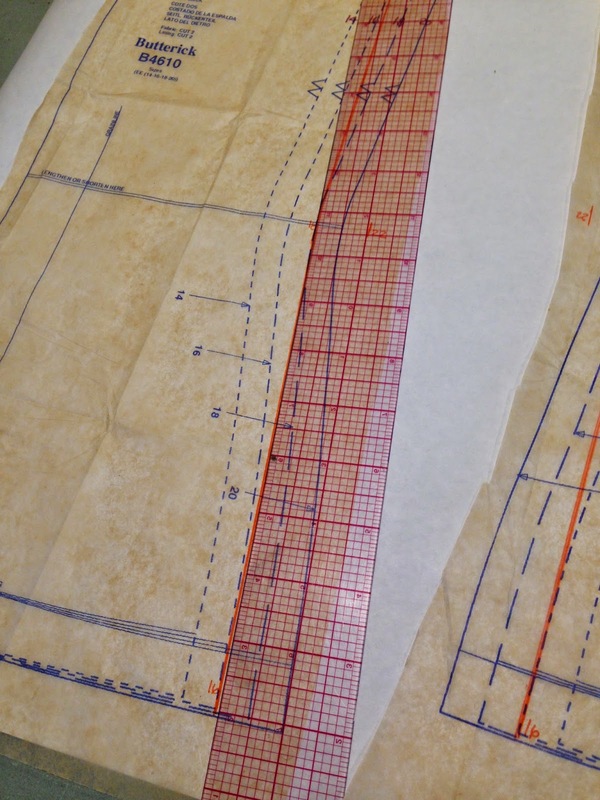 I like to use a contrasting pencil or marker so there's no doubt where the line is, and you don't lose track of which size you're cutting while you're cutting into your precious fabric. So as you can see below I marked the lines for the size 16 on the bust area. I've also drawn in the sizes here so you can see which size I'm marking. 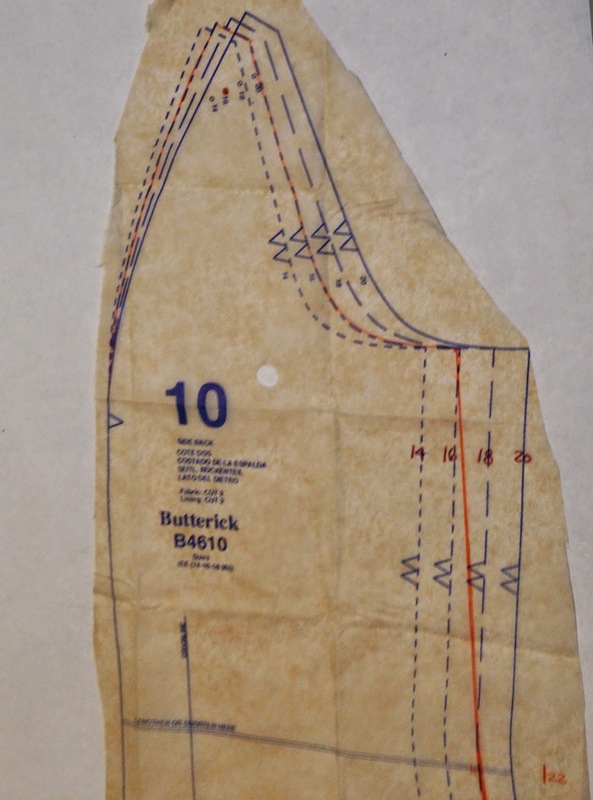 Next you'll go to the waist area and just put a mark on the waist at the size line you intend to cut for that area, and then do the same with the hip area. Then go back in with your gridded ruler and connect those lines as shown below. If you need to use a curve you can use that tool as well. So we connect the size 16 bust area to the size 18 waist area. And then the size 18 waist area to the size 16 hip area. And Voila! You have your adjusted pattern piece. Then you do the same with all the other pattern pieces. Mark every cutting line with the size that will fit your measurements. 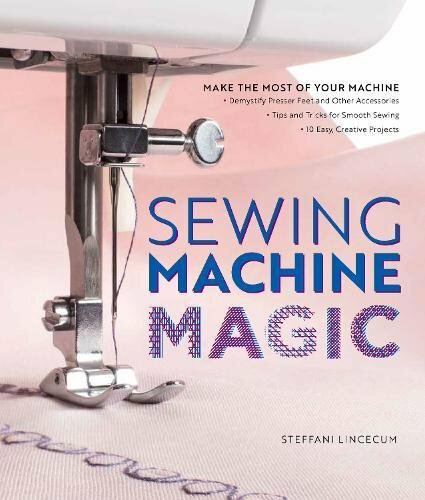 It's so simple, if you've been sewing and making things from patterns for a while it may seem obvious, but you'd be surprised how relieved people can be to see it demonstrated clearly. I agonized for years over whether it was better to adjust a pattern from the perimeter, or slash and spread from the inside. You'll find that if you were to slash and spread a version of this pattern and then do this method and put one on top of the other, they would be the same, given that you were adding the same amounts that the manufacturer adds for grading. This is also a terrific way to evaluate whether this style would be flattering on you. Often those of us who wore classic, fitted shapes with fitted side seams, and traditional horizontal bust darts and under bust darts in our 20s and 30s try to continue with that style because we think that's what's most flattering, but our bodies have changed and we might be better suited to a style that has maybe a diagonal french dart. 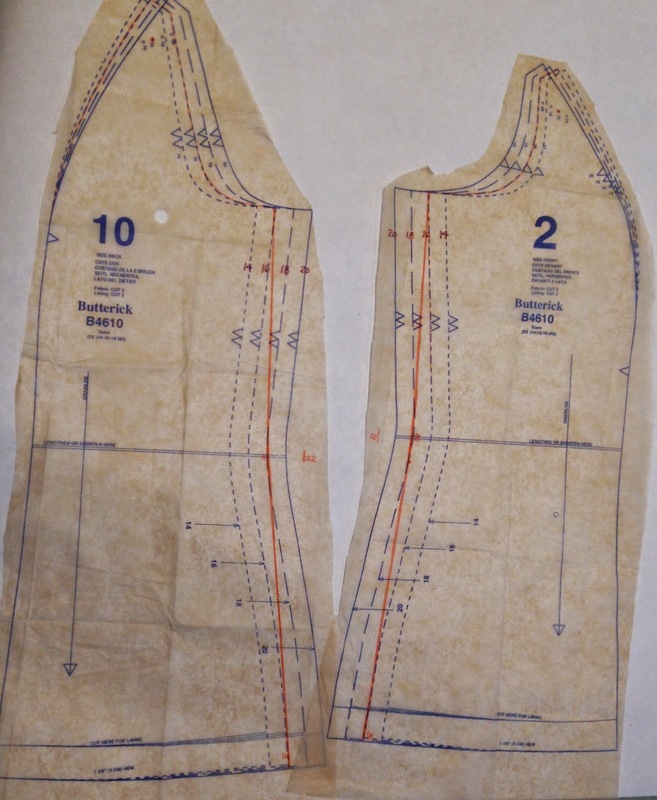 Anyway, doing this helps us to take our real world measurements and apply them to a pattern, taking out the guess work of which size to buy, and which size to cut and sew. This is just the tip of the pattern alteration iceberg as it were. 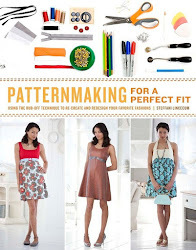 If you'd like to know more about pattern alteration I'd recommend these great classes. 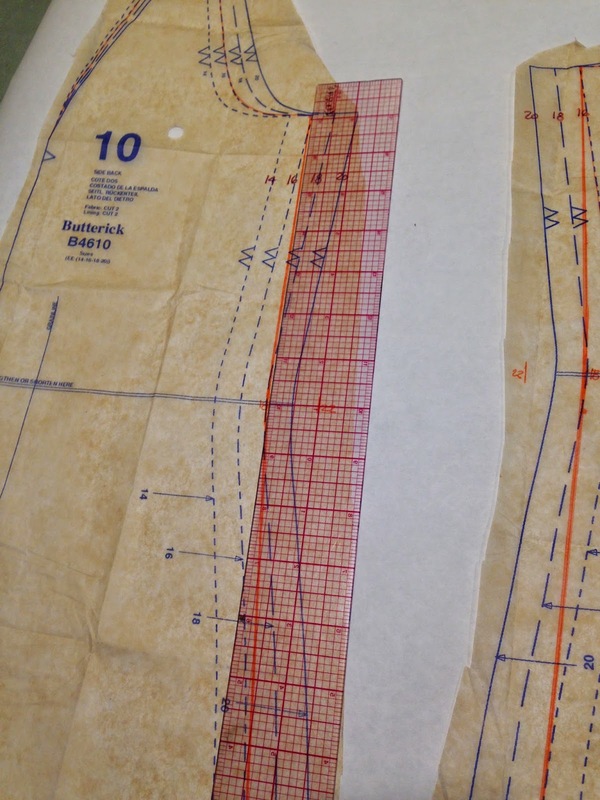 What sort of alterations do you usually make to your patterns?